If you've ever driven through the I-94 / I-275 interchange, you may have seen the property's 1960s-style "flying-saucer" water tower off to the south. Today there is a Home Depot shipping facility here, but as best I can tell this site used to be a factory with the address 38481 Huron River Drive, which was the headquarters of the historic Kelsey-Hayes Wheel Co. from about 1969 to about the 1980s. But why would an automotive supplier's plant need apparently WWII-era military guard towers, unless the plant was originally built for war production? My first impression was that the tower resembled those commonly found at an ordnance plant, or the Detroit Artillery Armory. Looking at the site on aerial imagery, it is hard not to notice how close it sits to Detroit Metro Airport, which during World War II was known as "Army Air Depot, Romulus," and "Romulus Army Air Field." It also appears that Northline Road, which is normally a straight east-west road, suddenly curves up northwest from the airport to go directly past this place, almost as if it was built as a service road between the two sites. Suddenly it seemed even more likely this facility could have originally been a government base after all. Looking at an aerial view of the area, Northline Road seems to curve suspiciously toward this site from Detroit Metro Airport, making me wonder if in fact it was originally built that way to serve as a driveway between the two facilities, as is often seen where Nike Missile sites or ammo dumps are often situated near Air National Guard bases, such as Selfridge ANGB. According to Detroit Metropolitan Airport History by local historian Daniel Mason, from 1941 to 1947 the Army Air Corps leased Metro Airport (then called Wayne County Airport), for the purpose of ferrying military airplanes and freight from coast to coast. 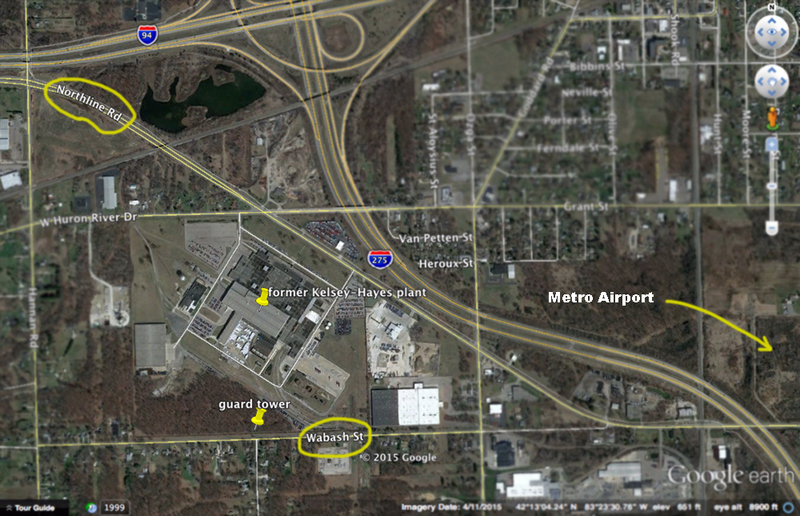 The Michigan National Guard also shared the airport with Wayne County's Airport Authority from 1930 to 1971. Under the Army's 345th Air Transport Command, the 3rd Ferrying Squadron--comprised of mostly of female pilots--was tasked with flying the various planes. Looking at historicaerials.com, I see that this angled stretch of Northline Road did not exist on their c.1942 topo map--it is shown as running east-west along the same roadbed that is now called Wabash Street. But Northline is shown as angled steeply to the northwest on their c.1953 topo map, and the east-west grade was being called "Old Northline." What looks to be the Kelsey-Hayes Plant is first shown on their c.1969 aerial photo, so at least the building itself could not have dated from the 1940s, but there could have been a small tarmac or supply yard there. I emailed local historian Daniel Mason, who specializes in the history of Romulus Army Air Field, to ask if he knew whether this property was ever a government installation. He said he was familiar with the tower in question, but lent his opinion that it was more likely a structure built by the railroad as a switch tower, or for security to keep watch over the switchyard. This makes sense, seeing as that approximate spot is where several railroad spurs branched off to enter the Kelsey-Hayes plant at various points. He also confirmed that my hunch about Northline Road being rerouted was correct, but it had more to do with airport expansion after WWII than it did with the disposition of the Kelsey-Hayes site. Per a comment from a reader, "bigguy1960," the c.1956 DTE aerial photograph of the site shows what looks like a total of three of these towers along the fenceline of Wabash Street. "It also appears that there is a cut along the fence to allow a vehicle to patrol," he noticed. Indeed, it does certainly seem like they are guard towers of some kind. The plant was apparently under construction in the 1952 aerial photograph, and looking at the 1967 photo, it seems that there were a total of five towers located around the entire perimeter of the plant. I did a little looking on old aerials myself (http://claslinux.clas.wayne.edu/photos/ap_index.htm). The 1952 Wayne County aerial shows the K-H plant under construction but no tower. The 1956 aerial, however shows not only the plant, but that there was a fenceline parallel to Wabash (nee Northline) and not one but THREE towers - one at each end and the remaining one in the center. It also appears that there is a cut along the fence to allow a vehicle to patrol. Given the time period, the dense woods, the towers having lights, being adjacent to a road, etc. is it possible that K-H was doing something for the Government at that time, and heightened security was needed? P.S. A little further review shows that there were FIVE towers - the 1967 Aerial shows the shadows of not only the three along Wabash, but also one in the Northwest corner near the railroad tracks, and one in the corner formed by the property line and the parking lot on the East side of the property (Southeast corner of said lot). I mean the northwest corner at Huron River Drive, not the railroad tracks. These were probably built when the plant was. This plant was originally to be a government jet engine plant, but was never utilized as such and was sold off to Kelsey Hayes. My dad worked at the Romulus K-H from 1969 until they closed around 1998. He said the plant was always well maintained and clean, and he loved working there. They made wheels at the Romulus location. I remember going to pick up a turkey around Christmas on year. From 1998-1999, he worked at the Detroit K-H at Livernois and McGraw, and hated it, retired the day he could. They made brake drums at the Detroit K-H while my dad was there. That factory too became abandoned a short time later, and is now all but gone. K-H was a quality product, good workforce. In the early 1990's I worked for Perot Systems at that Kelsey- Hayes facility. It used to be a jet engine plant when first built. Behind the main building there were concrete ramps where the jet engines were tested with the ramps used as blast shields for the exhaust. The jet exhaust was sent skyward instead of across the ground. The plant had a 12 foot high fence with barb wire and guard towers around the perimeter of the property. The plant made wheels when I worked there. By the time I left Perot around 1995, all of the front office personal were gone and the offices empty. The factory still made wheels but everyone else was gone except for Perot IT workers.